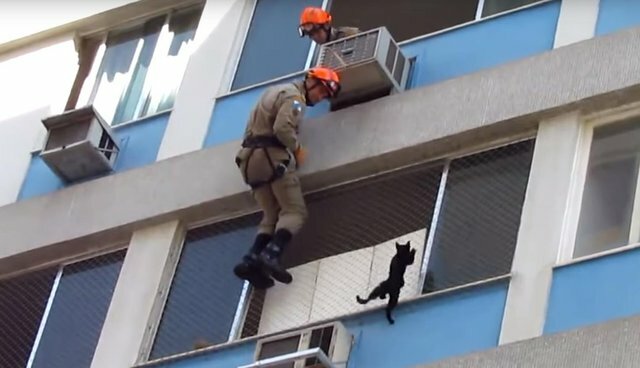 A cat who was trapped high up an apartment building is back on solid ground once again, all thanks to - or perhaps in spite of - one of the craziest pet rescues ever caught on film. 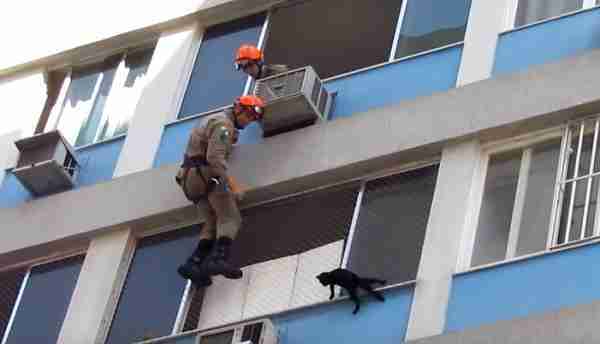 Firefighters in Rio de Janeiro, Brazil, were called to the scene on Monday, when the pet had apparently become stranded atop an air conditioning unit six floors up. Since no one was home to let them in, the rescue crew didn't try to reach the cat from the nearest window, but rather chose to rappel down from the apartment above. Crazy, right? Well, unsurprisingly, the panicked animal misread their good intentions and scrambled to get away. After several failed attempts to grab the cat, she ultimately plunged to the ground where, thankfully, other firefighters caught her with an outstretched blanket. Despite the rescue not going quite as planned, the incident ended remarkably well for the cat. Afterward, firefighters dropped her off with a local animal rescue group. A staffer there told The Dodo that the animal suffered no broken bones in the fall, and is expected to soon be reunited with her owner - who will be given a few tips on how best to keep windows secure for pets.